When a young man of 23 dies on a railway track - high on drugs and alcohol, having fled the police, his car abandoned at the side of a nearby road - it is perhaps misguided to direct sympathy anywhere other than to his family and friends. You're certainly not expected to expend sympathy on the young man's employers or others charged with monitoring his welfare at his place of work, especially when his profession was sport. 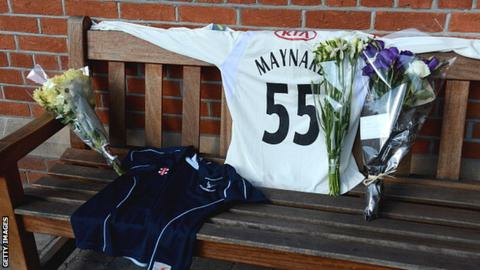 Following the inquest into the death of Surrey batsman Tom Maynard, English cricket has been subject to an inquest of its own. Does it have a major problem with recreational drugs? Is enough done to educate cricketers about the dangers of recreational drug abuse? Is testing for recreational drugs stringent enough? The inference is clear: that perhaps more could have been done to prevent Maynard's death; that perhaps English cricket failed in its duty of care. But while English cricket has concluded it can do more, it is also clear that it already does more than most professional environments to inform and educate its employees about the potential dangers of substance abuse. "We would be foolish to think this was an isolated incident but at the same time we don't have evidence that this is problem that is peculiar to cricket," says Angus Porter, chief executive of the Professional Cricketers' Association. "Among the population at large, about 9% of British adults have taken an illicit drug in the last 12 months and I don't think cricket is any different. "But our focus is making sure players understand the risks and consequences of taking drugs and abusing their bodies with alcohol and also that we educate them about the help that's available if they find themselves with a problem." The PCA provides online tutorials and a confidential helpline, through which cricketers can speak about any personal problems or report concerns about a team-mate, whether related to addiction or mental health. On Thursday, newly contracted professionals attended the PCA's annual Rookie Camp at Edgbaston, where they were briefed on a variety of potential dangers, from corruption to drugs to contract negotiations, with the overriding message that further education and help is readily available. It is all a far cry from Paul Smith's day, when the run-scoring, wicket-taking, lager-quaffing, pill-popping Warwickshire all-rounder of the county's 1990s glory years was left to flounder in that less enlightened age. "If I had put my hand up and said 'listen, I've got a problem', I would have been out of the door in a couple of months," says Smith, who was banned for two years in 1996 after opening up about his smorgasbord of vices in a tabloid interview. "But I've spoken to the PCA and they are very aware of the difference between recreational drugs and performance-enhancing drugs. So maybe we're going in the right direction. If I had been on my own disciplinary panel I'd have made sure I had a doctor there. What I got was a QC." That nobody in the game of cricket has asked for Smith's advice is strange. Since rebuilding his life, Smith has carved out a new career transforming the lives of street kids and ex-gang members in Los Angeles. He also works in an ambassadorial capacity for the Prince's Trust in Birmingham. In fairness to the PCA, it already employs recovering addicts - such as former Gloucestershire and Surrey fast bowler Richard Doughty, who draws on his experiences with alcoholism - to educate young cricketers and has done for a number of years. But it is instructive that Smith still feels ostracised from his sport. "I wouldn't ring the ECB [England and Wales Cricket Board] up, they'd have a bloody heart attack," says Smith. "But if the ECB and the game of cricket thought my experience and 15 years' worth of work was worth looking at, then great, I'd talk to them." Cricket has plenty of form for the draconian treatment of recreational drug users. When Arsenal's Paul Merson admitted to alcoholism and cocaine abuse in 1994, the Football Association arranged for him to undergo a rehabilitation programme. Partially mended, Merson was back in the side only three months later. Compare that to the treatment of Ed Giddins, the Sussex fast bowler who tested positive for cocaine in 1996. Banned for 18 months and released by his county, Giddins spent his time out of the game selling Christmas trees for a living. Then there is Graham Wagg, still in the game and playing for Glamorgan these days, but banned for 15 months in 2004 and his contract with Warwickshire terminated after he failed an ECB drugs test. That's a hefty punishment for what Wagg, a young man of 20 at the time, maintains was a first and one-off dabble with cocaine. "If you're taking nothing but recreational drugs that do nothing but affect your potential to perform," says Smith, who lost his marriage, his home and four stones in weight in the wake of his admission, "then it's a pretty small-minded group of people who decide a ban is the ultimate deterrent." Wagg can consider himself extremely unlucky - or lucky, depending on which way you look at it - to get caught. Up to 200 tests are carried out each year as part of the ECB's programme but county cricket's current procedures are less rigorous than both professional football and rugby in England. While football and rugby test for recreational drugs outside of competition, tests in cricket almost always take place on match days. The Rugby Football Union also tests hair samples, which can reveal whether players have used recreational drugs in the previous three months. Maynard's history of drug use was revealed in this way, although he was on a mortuary slab when the tests were made. The RFU also employs a 'two-strike' policy, whereby a player who fails a test for recreational drugs will be offered confidential medical treatment and support, at least the first time. It is the RFU model that Porter is keen to replicate. There is a school of thought that cricketers are more predisposed to reckless behaviour owing to the sport's long hours, the many days and weeks living out of a suitcase in strange hotels and the effect that might have on wealthy young men seeking thrills. "Young players are rewarded very quickly on the back of a few good innings," says Maynard's former Surrey team-mate Mark Ramprakash. "It can be very tempting for young men, if they're earning a few quid, to go out and enjoy themselves." But Smith, memorably described by his Warwickshire skipper Dermot Reeve as "cricket's first bimbo", argues modern cricketers are less likely to err than in his day. And what young men don't go out and enjoy themselves, then or now, whether cricketers or students, and whether earning a few quid or not? "It's a far more professional environment now," says Smith, whose Warwickshire team-mates Reeve and Keith Piper also admitted to drug use during their playing careers. "They play the English season, have a month off and are then back in for practice three or four times a week. "When I played, you could be a professional cricketer for the summer, turn into a guy who went to the pub seven days a week for seven months, then turn back into a professional cricketer again the following April." The opportunities for dissolute behaviour may be fewer in the modern game, although they still exist. But even Smith managed to keep his vices from his bosses, and this was a man who once walked out to bat against Malcolm Marshall drunk to the gills and wondering where he was. So it is difficult not to sympathise with Surrey chairman Richard Thompson and chief executive Richard Gould when they wonder aloud what the club could have done given Maynard's closest friends claim not to have known the extent of his problems. And it is difficult not to have a degree of sympathy for English cricket in general, because its administrators and employers have done more than most professions to educate and help its employees - at least in recent years. There will always be young men who remain beyond help, whether drug users, gamblers or thieves, whether cricketers, bricklayers or priests. Which is not to say that English cricket cannot do more. It can and no doubt will.